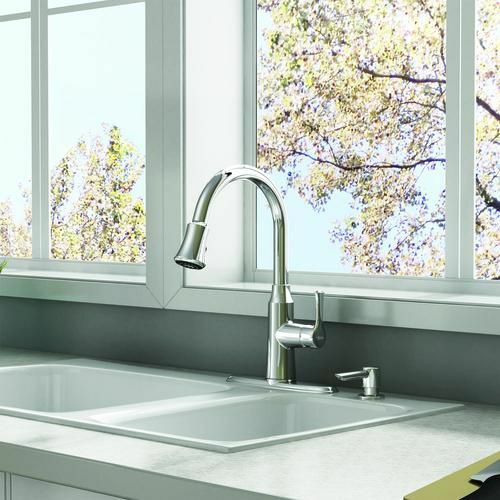 With a modern detailed design, the Danoa Kitchen faucet offers European styling to add to any Kitchen update. Suitable for a single or three hole installation using optional base plate. Danoa Single-Handle Pull-Down 3-Function Sprayer Kitchen Faucet with Soap Dispenser in Chrome With a modern detailed design, the Danoa Kitchen faucet offers European styling to add to any Kitchen update. Suitable for a single or three hole installation using optional base plate. Danoa Single-Handle Pull-Down 3-Function Sprayer Kitchen Faucet with Soap Dispenser in Chrome is rated 4.0 out of 5 by 2. Rated 5 out of 5 by Skseibel from Great tap, good quality and good looks! I just bought and installed this faucet a couple days ago and it works and looks great. Easy to install and am impressed with the quality of materials. So far so good! Does this faucet swivel from left to right to spray the sink without pulling the top out/down? Yes, the Danoa has a swivel spout left and right. Does this have a ceramic cartridge? Yes, the Danoa has Ceramic Disc Valve Cartridge for smooth, precise valve control and a lifetime of drip-free, maintenance-free performance. Also the brass construction is made of a high quality material for durability and long life.